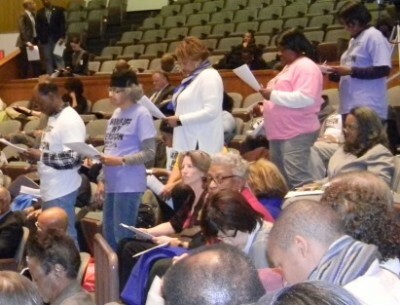 DAREA members settle in to confront Detroit City Council March 22, 2016. 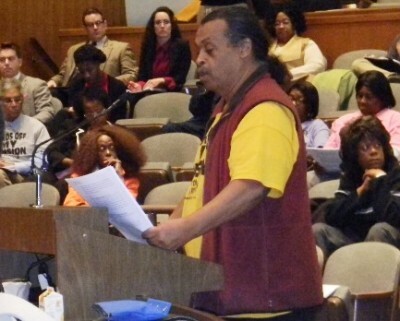 Detroit City Council members hear DAREA demands at Committee of the Whole March 22, 2016. The crimes that have been committed against Flint’s residents were made possible by the right wing Republican Legislature and Governor Snyder through Public Act 436 of 2012, the Emergency Management Law that replaced PA 4 voted down 37 days earlier by Michigan voters. This is the same act used to take Detroit into bankruptcy and steal the City of Detroit retirees and active employee’s pensions, health insurance, cost of living and annuity savings fund, without any representation by Detroit’s democratically elected officials. This same act enables Governor Snyder through his emergency manager, Kevyn Orr, to privatize Detroit’s Water Department, Public Lighting, Health Department, Human Services, Planning and Development, Workforce Development and most other departments. DAREA Pres. 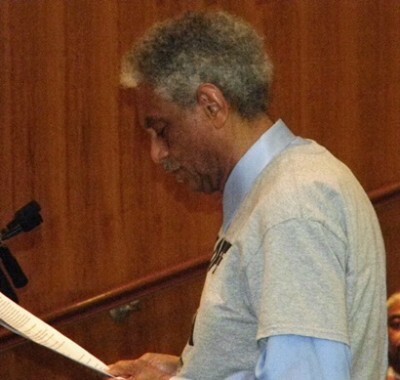 William Davis, a DWSD retiree, begins presentation to City Council; dozens of members took turns reading it to the end. The City of Detroit has been privatized under PA 436! City government has been contracted out to private entities and/or authorities. 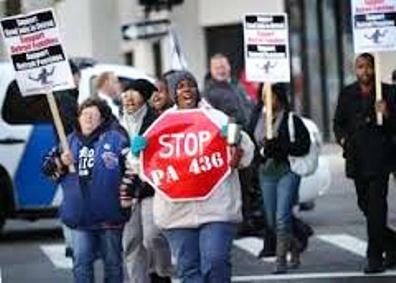 The City of Detroit’s civil service system and unions have been diminished and/or destroyed under PA 436. Employees live under the constant threat of dismissal for no reason other than policies imposed by, first the State’s Consent Agreement of 2012, and later Emergency Manager directives and orders. Democracy has not been restored and current elected officials are carrying out the bankruptcy plan of adjustment and executive orders of the EM and a Financial Review Committee appointed or approved by the governor that will continue to provide oversight for the next ten years. The current mayor continues to follow the plan imposed by the Emergency Manager, which allows him to issue no bid contracts, hire his own people and eliminate city employees. Job descriptions are being rewritten with the sole purpose of disqualifying current employees. 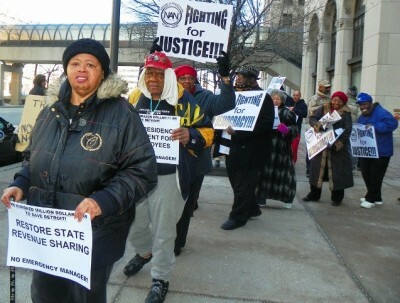 Fair labor practices are not being practiced in the City of Detroit. Slavemaster Snyder attacks Michigan’s majority-Black, poor cities, school districts through EM law. 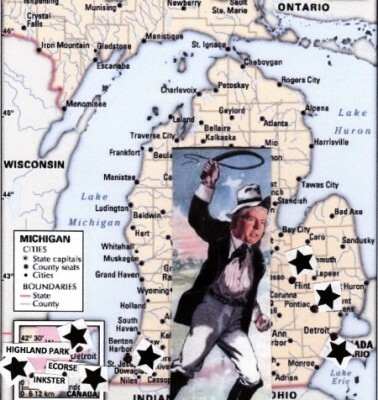 Under Governor Snyder’s reign, emergency managers have been imposed on Benton Harbor, Ecorse, Saginaw, Highland Park, Flint, Detroit and Detroit Public School System. What do these cities and school system have in common? They are all former manufacturing cities and a system that were abandoned by the industries. These industries created the middle class, which sustained the municipalities and institutions. The state government also abandoned these cities and school districts long before the financial crisis was exacerbated by the state. The State of Michigan government refused to pay revenue sharing to its cities which is one major factor contributing to revenue shortfalls. Over $732 million dollars in revenue sharing funds were cut from Detroit since 2003. One major responsibility of State government is to ensure that municipalities are financially solvent, not to cause financial insolvency. DAREA members line up to speak during Council public comment session March 22, 2016. All of the cities and school systems placed under PA 436 Emergency Management Act are majority African-American and a large percentage of the residents live below the poverty line. Flint’s water was allegedly switched from Detroit to the Flint river to save about $5 million by a state appointed emergency manager. This switch will now cost the city of Flint, State of Michigan and the Federal Government several hundred million dollars to repair. The state was slow to accept responsibility, and declare a state of emergency to get needed assistance. Even today state legislators are still debating what to pay for the infrastructure repairs. Lives have been changed and many damaged forever; people have died. This is one of the worst crimes that a government can commit against its unsuspecting citizens. The entire population of Flint was poisoned by lead in the water, killed by Legionnaire’s Disease, under Gov. Snyder and EM Darnell Earley. The poisoning of Flint water is the worst crime committed against Michigan residents under PA436; let’s hope it doesn’t get any worse. Flint’s water crisis was committed by Governor Snyder against the people of Michigan under the authority of PA 436 EM dictator law. However, it is not the only crime that has been committed against Michigan residents under PA 436 Emergency Management Law and it won’t be the last if this law is not legislatively eliminated. If we fail to connect the dots, the crimes committed through the use of PA 436 EM Law, Governor Snyder, the State of Michigan and its officials will not truly be held accountable. This law was imposed on selective de-industrialized cities with high concentrations of African Americans and workers who primarily vote democratic. The intent of PA 436 was to transfer all wealth from the working class through privatization of public assets, union busting, and gentrification of urban areas. Government officials and local control is eliminated through PA 436 and a state appointed Emergency Manager has total control over all finances and decisions made for the cities or school districts. 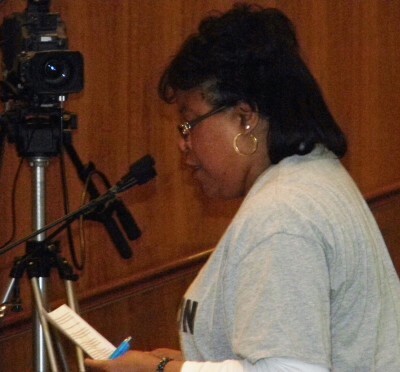 DAREA’s Yvonne Jones speaks to City Council. From 1999 to present, the State of Michigan has controlled DPS with the exception of three years. DPS went from almost a $100 million surplus in fiscal year 1999-2000, to a $763.7 million deficit in fiscal year 2013-2014 fiscal year. Student enrollment in 1999 was 173,848; today it is approximately 47,800. Emergency Managers have not made anything better at Detroit Public Schools. Under Emergency Management most neighborhood public schools have closed, enrollment is at all-time low, classroom sizes are at all-time high, and physical conditions of the schools are in disrepair, putting children’s lives at risk. On the other hand, under Emergency Management, administration salaries have sky rocketed, no bid contracts have flourished, unions are being busted, certified teachers laid off and non-certified non-union teachers have been hired. Charter schools are replacing Detroit’s Public Schools and are allowed to hire non-certified teachers from Teach for America. In Detroit under PA 436, the EM created an alternative district, the Education Achievement Authority (EAA) for allegedly under achieving public schools. The facts show under this alternative district the neediest students have received a substandard education. The EAA has only served to increase the DPS deficit. The EAA has proven to be an abysmal failure and further produced lower achievement scores for its students. Steven Rhodes was the federal judge who presided over the Detroit bankruptcy, ruling that Emergency Managers are allowed to take the same action as elected officials, which included taking a city into bankruptcy. He also ruled that pensions could be diminished and impaired, which is in conflict with the State constitution and the language in PA 436 related to protecting pensions. Former Judge Rhodes has now been appointed the Emergency Manager of DPS. His appointment, if not a conflict of interest, is morally and ethically corrupt. We must connect the dots. DAREA’s Walter Knall takes his turn at CC podium March 22, 2016. The level of Detroit’s debt was first alleged to be $4.5 Billion, the amount of debt continued to increase until it reached the figure of $18 Billion. The actual debt reduction for Detroit was approximately $7 billion at the bankruptcy confirmation, of which $ 3.85 Billion came from retirees and active employee’s health insurance, another $1.7 Billion came from retiree’s pension checks and employee wage reductions, cost of living allowances were eliminated for general fund retirees, and to add insult to injury the General Fund retirees and employee’s annuity funds were looted by another 15.5%, between the years of 2004-2013. A total of $5.5 billion, or 78% of the total bankruptcy relief was on the backs of retirees and employees. However, the Banks and lending institutions were given something in exchange for the small amount of debt that was reduced from them. They were given river front property, revenue for 30 years from the tunnel to Windsor Ontario, parking lots and other city owned properties. 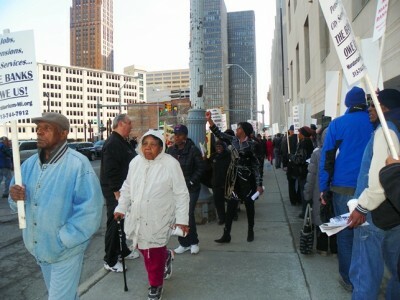 Detroit retirees and their supporters protest outside bankruptcy hearing April 1, 2014. Dozens of such protests were held. Retirees and employees got nothing and live with the threat that if the city can’t pay its debt they can come back on the retirees and employees for a greater reduction. The level of funding of the general fund retirement system was never proven. During the three years that the City was under the Consent Agreement and Emergency Management, no payments were made to the General Retirement Fund however, the Funds never went below a 70% funding level. This level of funding is higher than the State of Michigan, Wayne County and many public service pension funds. During the Mayor’s State of the City Address, he stated that the Emergency Manager underestimated the city’s pension obligation by over $450 million. This mayor was consulted prior to selection of and throughout the appointment of the EM Kevyn Orr. The ink is barely dry on the bankruptcy plan of adjustment and underfunding of pension obligations is being discussed. Remember the “grand bargain” does not hold the city responsible for pension shortfalls and pension obligations are not due until 2024. The mayor felt it necessary to address possible future underfunding of the pension fund with no proof, suggesting to the listeners that legacy cost will continue to be Detroit’s’ problem. DAREA members, in distinctive “Hands off my pension!” T-shirts, pack CC audience March 22, 2016. 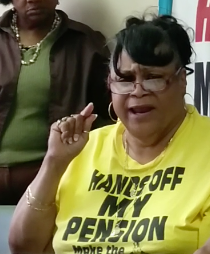 Detroit Active and Retired Employees Association (DAREA) believes crimes were committed against retirees, active workers and Detroit ‘s citizens in general. 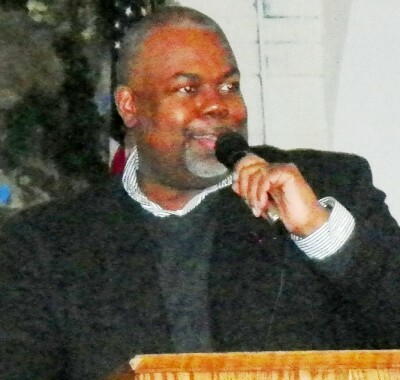 DAREA believes the bankruptcy was orchestrated by Governor Snyder using disaster capitalism and implemented by the Emergency Manger Kevyn Orr to eliminate health care for retirees and workers, to privatize the city of Detroit’s assets and services and to transfer the remainder of Detroit’s wealth. Did Detroit have financial problems? Yes, like many deindustrialized cities in the rust belt. 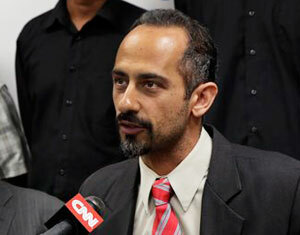 Possible solutions offered by unions and local officials were rejected by the state. Was it necessary to bankrupt Detroit to solve its financial problems? No, it was not necessary! Falling State Revenue sharing, not addressed. Of the three leading causes of Detroit’s falling revenue only one was addressed in the Plan of Adjustment, retirees’ cost. Legacy cost was blamed for the majority of Detroit’s debt. Were Wall Street’s COPS and illegal SWAPS and City financing of bonds to unnecessarily refinance of DWSD debt held accountable for Detroit’s cash flow crisis? Were predatory lending and the mortgage financial crisis held accountable? Were the banks made to pay? 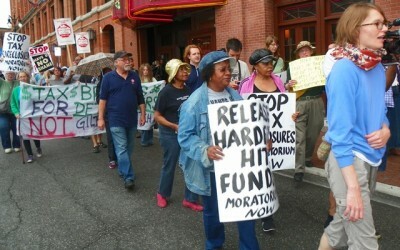 DAREA members participate in tax foreclosure protest outside Register of Deeds office. Under a Blight Task force that only addresses demolition, no plans are being made to help Detroiters keep or regain houses lost during the mortgage crisis; the majority of federal hardest hit funds are being used for demolition and not to help people stay in their homes. No solutions to address houses being incorrectly assessed causing thousands of people to lose homes to tax foreclosures causing more loss revenue to the city. Massive water shut offs enforced to increase revenue to the City on citizens who do not have it to pay. No real affordable plan made available to keep people in their homes. On March 22, 2016 we are calling for a full investigation of Detroit’s bankruptcy and Public Act 436. We demand that State of Michigan legislators and Governor Snyder be fully investigated for their actions against citizens of Michigan, for imposing Public Act 436 on the people after a very similar Act (PA4) had been recently voted down in a state wide election. We demand that the State of Michigan beheld liable for Detroit’s financial problems due to its refusal to pay revenue sharing. DAREA member brings rousing close to presentation. City Council meetings are seen on TV across Detroit, making them a perfect forum to reach out to the people. The State of Michigan’s constitution didn’t matter, nor did our no votes. More than 50% of retirees and active employees in Class 11 did not vote. Many believed that if they voted for this illegal action that they were legitimatizing the recommended cuts and would give up their legal rights to sue and for due process under the law. DAREA believes that PA 436 is the anti-democratic dictator law that has taken away the rights of the aforementioned cities and school districts, is the common denominator used to take Detroit into bankruptcy, take over and privatize school districts, and is responsible for the lead poisoning of many of the residents of Flint, Michigan. All of these acts are crimes to the detriment of the citizens affected. DAREA is requesting that this Detroit City Council pass a resolution in opposition to the continued imposition of PA 436, through the Executive Orders and directives left by the emergency manager, oppose mayoral control of DPS, restore the elected board, and support actions to resolve the Flint water crisis that include repairing the system and providing safe water to every home. 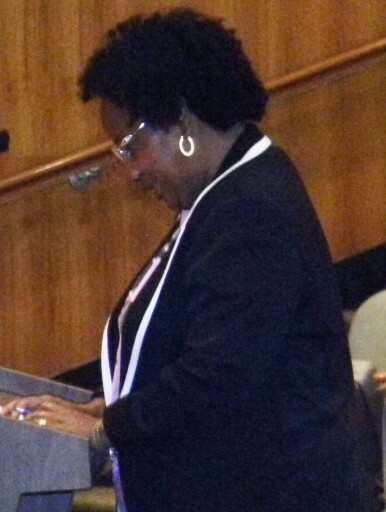 In memoriam: DAREA corresponding secretary Belinda Myers Florence, who battled to the end. All of these actions were state-initiated through PA 436, which ignores the “State Constitution Article on Home Rule,” for the municipalities affected by a far reaching Republican Legislature, in some cases with local compliance and support. DAREA demands that our pensions be restored. The State of Michigan Constitution Article IX Section 24 guarantees that public service pensions cannot be diminished or impaired. 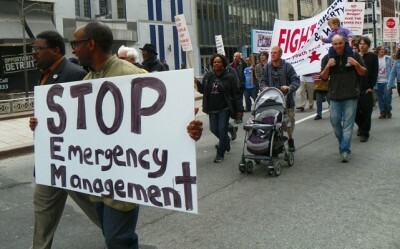 Because of PA 436 and the imposition of the Emergency Manager Detroit was taken into bankruptcy and democracy eliminated. Some of the dozens of DAREA members who presented position statement on EM law and its dire consequences to City Council March 22, 2016. DAREA MEETS THE FIRST WEDNESDAY OF EVERY MONTH AT 5:30 PM at St. Matthews and St. Joseph Church at Woodward and Holbrook, and the THIRD MONDAY OF EVERY MONTH at Nandi’s Knowledge Café, 12511 Woodward, Highland Park. 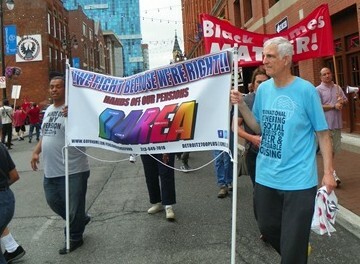 DAREA: We fight because we’re right! May Day protest against Detroit takeover May 1, 2014. 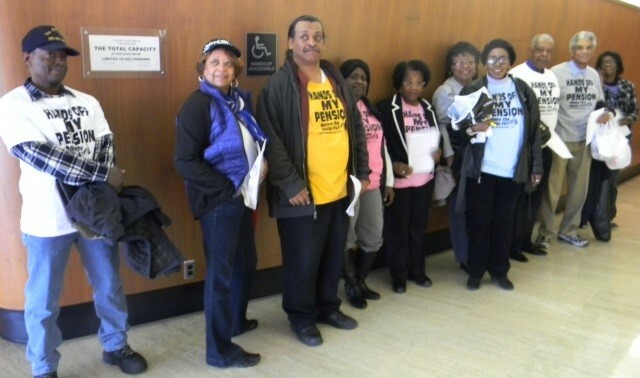 March 14, 2016, Flint, MI – Civil rights attorneys from the Sugar Law Center for Economic & Social Justice, National Lawyers Guild, Sanders Law Firm, the ACLU and the Center for Constitutional Rights have filed an appeal in Phillips v. Snyder, a 2013 federal lawsuit challenging Michigan’s controversial emergency manager law, Public Act 436. The appeal urges the U.S. Court of Appeals for the Sixth Circuit to reinstate claims that the law discriminates on the basis of income and race, deprives thousands of Michigan citizens of their fundamental right to vote, freedom of speech and association, and the Voting Rights Act. See full brief at http://sugarlaw.org/wp-content/uploads/2016/03/Sixth-Circuit-Brief.pdf. 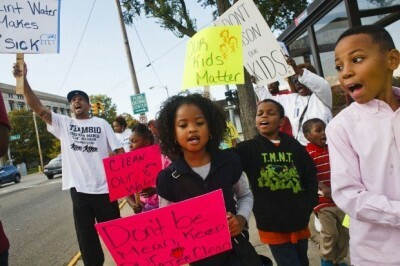 Flint kids join protest against poisoning of their city’s water. The law allows the state to replace locally-elected mayors, city and town councils, and school boards in so-called “financially-distressed” municipalities and school districts with unelected emergency managers. Emergency managers in the city of Flint were directly responsible for switching the source of the city’s water supply to the contaminated Flint River, poisoning the city’s population. Emergency mangers have been imposed almost exclusively upon low-income communities of color throughout the state. Fifty percent of Michigan’s Black residents have been placed under emergency manager rule, compared to only two percent of the state’s white population. 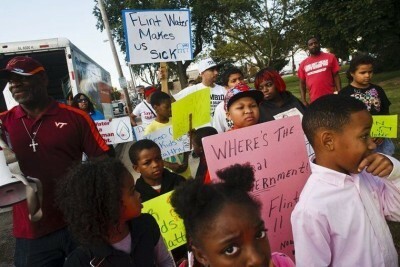 “To see the danger of Michigan’s emergency manager law, we need only to look at the tragedy in Flint, where unelected emergency managers unaccountable to the city’s residents made decisions that have caused grave harm to the lives and health of thousands of people, most of them low income people of color and many of them children,” said attorney Herb Sanders, a member of the Plaintiffs’ legal team. Public Act 436 shifts all legislative and executive power from locally-elected officials to state- appointed emergency managers. The case argues that the law violates federal constitutional rights to due process of law and discriminates on the basis of income by depriving residents of financially-struggling cities and towns throughout Michigan of the right to vote to elect the officials that govern them. In addition, the lawsuit claims that the law has been applied in a racially-discriminatory manner that overwhelmingly targets majority-Black communities for emergency manager rule and thus violates both the Equal Protection Clause of the Fourteenth Amendment of the Constitution and Section 2 of the Voting Rights Act of 1965 (VRA). A lower court allowed the Equal Protection racial discrimination claim to proceed, but dismissed the due process, income discrimination, freedom of speech, Voting Rights Act and republican form of government claims, ruling that the Constitution does not recognize a fundamental right to vote and that the VRA only protects the right to cast a ballot. Michigan’s previous emergency manager law enacted in 2011, was repealed in a statewide voter referendum in 2012. One month later, the Michigan legislature enacted the new emergency manager law challenged today. Michigan’s law is unprecedented, the first such measure enacted anywhere in the United States that shifts all legislative and executive power from elected officials to appointed officials. Phillips follows an earlier case, Brown v. Snyder, that challenged Michigan’s previous emergency manager law. That case was rendered moot when the law was repealed. 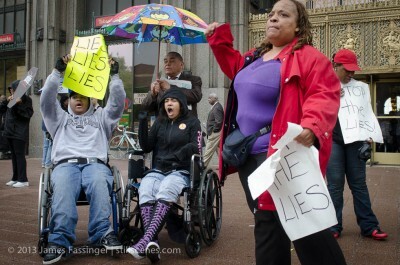 Protest during Detroit bankruptcy hearings. The Sugar Law Center for Economic and Social Justice, the National Lawyers Guild/Michigan-Detroit Chapter, the ACLU and the Center for Constitutional Rights (CCR), along with several Michigan civil rights lawyers filed both cases. Snyder knew all about what was going on in Flint MI. Nowhere in the U.S. Constitution is there any mention of where it gives the states the right to abrogate, suspend or otherwise interfere with the democracy and autonomy of locality within the state based on financial considerations. That is tantamount to “slavery” based on perceived financial debt considerations. The State takeover under P.A. 436 is based solely on those financial debt considerations. Slavery was abolished under the 13th Amendment to the U.S. Const. P.A. 436 is an overreach of the State against its people and violates the 2nd, 13th and 14th amendments to the U.S. Constitution. P.A. 436 is apparently not a panacea for solving financial considerations of a given community, e.g., Flint MI water crisis and DPS, which was caused by the state’s use of P.A. 436. The State can and should find better legislation and ways to deal with the financial considerations of troubled communities other than failed legislation such as P.A. 436. The State should seek to establish a consortium and cooperation through partnerships with communities with troubled financial considerations rather than a monarchial type takeover to foster cooperation and trust of the local community with the State rather than dissent and distrust of the local community against the state. The State can and should find ways to help communities with troubled financial considerations without abrogating, suspending or otherwise interfering with the democracy and autonomy of a given community based on financial considerations. Why can’t the State do that? When the People of Michigan are denied their voice then they have no choice, where democracy and autonomy are squashed by the State; there are no checks and balances to control abuses of power by the overriding authority of the State. Amen!!! I was deeply disturbed at the possibility that the Detroit retires would not be able to push back !!!! !